Yesterday I was able to go to the Western North Carolina Fiber/Handweavers Guild Silent Auction. This was the guild I belonged to before I moved to Florida, so it was nice to be able to go to this event once again. 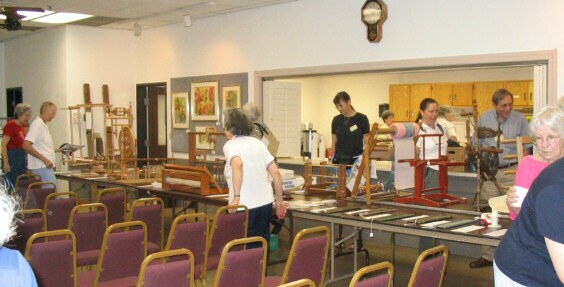 The auction serves as a fund raiser for the Blue Ridge Handweaving Show. The best part of going was being able to see my friends from the Blue Ridge Spinners: Carol, Mary, Eva, and Gail. 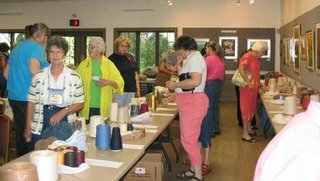 I was also able to see Betsy, who first taught me to weave, and Pat, whom I first met through Betsy’s classes, as well as other WNCF/H guild members. I like silent auctions. I like browsing slowly through the items and writing down my bids. In my mind I keep a limit for each item, depending on what value I think it has to me. Sometimes I’ll write down my name if no one else has bid on an item. After all, I can probably find something to do with that cone of yarn if it’s only $1. I wasn‘t looking for anything in particular, I just went to see what there was and bid. 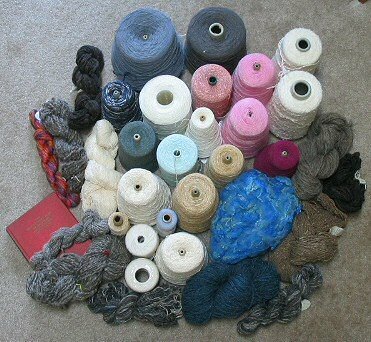 This suits me because my weaving yarn stash is completely made up of mill ends and other oddments, just a hodge-podge collection. Occasionally I purchase yarn specifically for a weaving project I have in mind, but more often I enjoy the challenge of designing strictly from what I have at hand. What makes a silent auction interesting is that unless one keeps track of the status of all the items one has bid on, the outcome is unsure! Who’s to know which items will get one more bid when that final warning sounds. So, I was surprised that I “won” so many of the things I’d bid on. In past I’ve gone away with less than half of what I bid on. My DH, who is my best and most encouraging enabler, didn’t even ask how much I’d spent nor where I was going to find room to put it all! Even so, I’m pleased to say that my cost turned out to be less than $1.40 per item. I do confess that where to put it is a problem at the moment. But I'm very happy with my bargains so that consideration will just have to wait until tomorrow! Congradulations on you "winnings"! What a great idea and it sounds like a lot of fun. Well, my suggestion would be to design a project of two and use it all up before finding a place to stash it!! Wow, Leigh, I wish I could have been there too! That looks like a pretty impressive haul. It looks as though a fair bit of it might be good for either weaving or knitting.